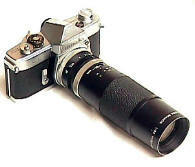 Minolta's founder Mr. Tashima obviously spent much effort trying to make sure his first 35 SLR was an artistic success. The SR-2 has beautiful smooth clean styling. 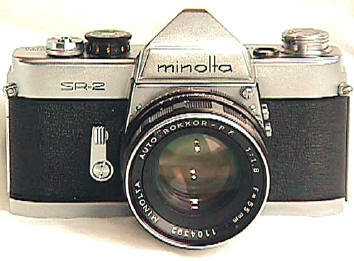 The SR-2's size and shape continued even to the highest development of Minolta's mechanical SLRs, the SRT-202 of 1975. The SR-2 was introduced before the Nikon F and Canonflex, but after the Pentax, Miranda, and Zunow. Both Zunow and Minolta announced SLR motor drives BEFORE the Nikon F. Alas, neither of the units made it to production, leaving the Nikon F to have the first electric production motor drive of any Japanese SLR. Although the SR-2 was introduced in Japan before the Canonflex and Nikon F, incredibly all three were introduced to America at the same Philadelphia photo show in March 1959. The SR-2 with 55/1.8 had a list price of $249.50, the Canonflex with 50/2 had a list price of $299.95, the Nikon F with a 50/2 had a list price of 359.50. The Minolta manual focus mount continues on today since Minolta is still making MD mount cameras and lenses, though only in a secondary basis to their Autofocus SLRs. Minolta was proud of its viewfinder, claiming that the SR-2 had the "World's brightest viewing system." Side by side with the slightly later Nikon F, the SR-2 does have a brighter screen than the early F screens. 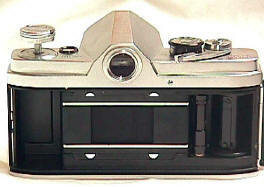 The SR-2 has no fresnell screen lines visible, unlike the early Nikon F's. 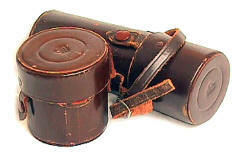 Initially offered only with a ground glass central focusing screen, buyers eventually had the choice of a split image rangefinder screen, but they were not user interchangeable. 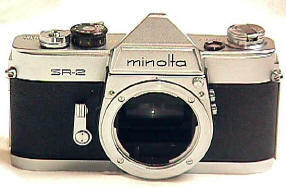 The SR-2 did have an instant return mirror -- Minolta was only the third Japanese manufacturer to have one after Asahi Pentax and Zunow. Like most 35 SLRs of its time, it did not have depth of field preview or mirror lockup. Production is unknown, but the SR-2 is not a common camera. The rarest SR-2 is the black version, which is also probably the rarest Minolta SLR. Aesthetically the SR-2 is a very handsome camera. Perhaps Tashima was determined not to repeat his mistake on the original Minolta A of 1947, his first 35. A well made Leica screw mount rangefinder, the Minolta A was innovative and competent, but rather ugly and never gained favor in the US market. Just about every reference you will read on the SR-2 says it has an "automatic diaphragm." It's not so. You see, what was "automatic" in 1958 terms is "semi-automatic" in modern terms. To quote Minolta's first American ad in June of 1959 "The world's first system where 'lens automation' is directly synchronized to the Rapid Film Wind Lever. Advance the Rapid Film Wind Lever and automatically - lens diaphragm opens to its largest aperture: film advances; shutter is cocked; frame is counted." The lens stopped down automatically to the pre-selected aperture, but did not open up again until the film was advanced. Because the user did not have to manually reopen the aperture, this was considered an "automatic" diaphragm. 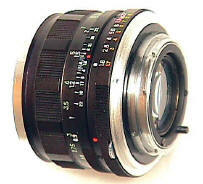 As SLR development went on however, the term "automatic" diaphragm came to mean an aperture which stopped down and reopened automatically immediately after exposure. Times and terms change. Oddly, if you mount a SR-2 "automatic" lens on a later MC, MD or X series camera, it does have automatic diaphragm action on the later body -- although there is no meter coupling. However, if you mount a later MC, MD, or X lens on a SR-2, it has the same semi-automatic operation as the original SR-2 lens because the camera body controls the diaphragm action. As introduced to the US market, the Minolta SR-2 only offered a three lens lineup: the six element 55/1.8 with close focus to 19.7 inches, a five element 100/3.5, and a seven element 135/2.8. That's right, Minolta started its lineup with only three lenses! 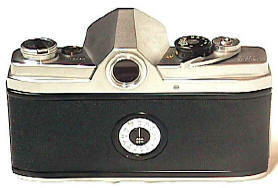 The 55 and 100 were semi-automatic -- the lens stopped down automatically to the selected aperture, but did not return to full aperture until the film was advanced. The 135 was pre-set, which means you pre-set the aperture on one aperture ring, and manually closed it down and opened it back up again on another aperture ring. Lenses reported under development in 1959 included a 55/1.5, 85/1.8, 100/2, 180/2.5 and 240/4 -- but I don't think any of these early versions actually made it to regular production. Available in the first American SR-2 ad of June 1958 were the 55/1.8 semi-automatic, 100/3.5 semi automatic, and 135/2.8 pre-set. Promised in the near future in that same ad were the 35/2.8, 55/1.5, 180/2.5, 250/4, 600/5.6, motor drive, and stereo attachment. 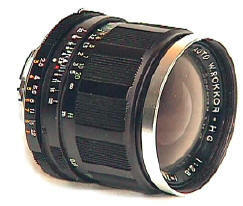 Rokkors available in the US in 1960 were the 35/2.8, 55/1.8, 100/4, 135/4, 135/2.8, 200/3.5, 250/4, and 600/5.6. 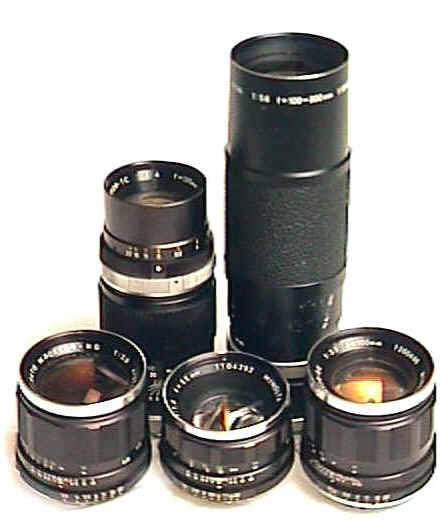 The 100/4, 135/4, and 600/5.6 were pre-set lenses. 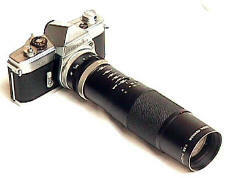 1962 saw the introduction of the 80-160/3.5 Auto Zoom Rokkor, a rather large dual ring 16 element zoom with a list price of $399.50. It's interesting that Minolta's first SLR was the SR-2, not the SR-1 (which was introduced later with a top speed of 1/500th). 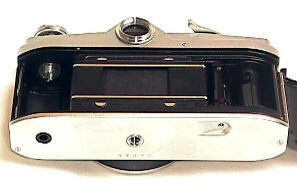 Asahi also introduced its famous Asahiflex IIb with instant return mirror before its IIa (with slow speeds added). Likewise Leica introduced its M mount with the M3 in 1953, only to follow with less expensive versions for its M1 and M2. Open the back by lifting the rewind lever. 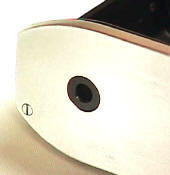 The take up spool is a single slot type, which strangely slices through the film leader when you rewind the film. The SR-2 controls are large, convenient, and well laid out. Note the useless but nicely styled "terraces" along the back edges of the SR-2's top plate -- style was important on Mr. Tashima's first SLR. The rewind lever is thankfully large and easy to use, much more so than the Nikon F's small rewind lever which was strangely used throughout its production. The automatic frame counter is easily seen on the left side top plate. The ratcheted advance lever is large and comfortable though its longish 180 degree stroke. The advance lever design is elegantly simple, rotating around the shutter release -- like the Leica M3. To turn the aperture ring on the original 55/1.8 PF Rokkor, you had to depress a chrome latch. The left pic shows the chrome latch at the rear of the lens near the lens mount. Its knurled edge is barely visible to the right, opposite the FP sync marking. Separate PC connections were used for flashbulbs (FP) and electronic flash (X). The large knurled chrome button is the lens release, a design which lived on to the last of the mechanical Minoltas, the SRT-202. 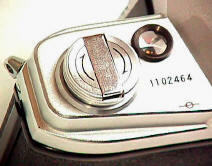 OK Minolta Super Fans, What is that little black hole for on the bottom plate?? I am fairly sure it is the anchor point of Minolta's announced, but never produced, SR-2 electric motor drive. That's right Minolta fans, the SR-2 announced the availability of a motor before the Nikon F! Unfortunately it was an awkward design, similar to the Alpa, that did not have an internal connection. Instead, a complicated mechanism manipulated the lever advance and normal shutter release! You guessed it. Once Minolta saw Nikon's much more advanced motor which did make it to production, Minolta quietly shelved production of its motor. A good thing too. Later the motor, or at least a version for it, was produced for professional use in very limited quantities for the SR-3. SR-2 Cases are not easy to find today. 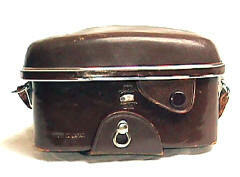 They were well made, heavy duty leather cases with metal trim. On a separate page to cut down loading time are Minolta's 1st two American SR-2 Ads. Click here. Black SR2? Does anyone know of a black SR-2? If you do, please email me the serial #. Serial Numbers: If there is a definitive list for SR-2 serial numbers, as well as the early SR lenses, please direct me to it. In any case, accurate information seems to be lacking in English. So, I am collecting serial numbers of the SR-2, SR-1, SR-3 in an effort to determine production figures. Please email me. Eventually the results will be posted here. Family portrait of early Rokkors: left to right: 35/2.8, 135/4, 55/1.8, 100-200/5.6, 100/3.5. 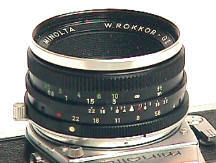 Minolta's 1st SLR wide angle, the 35/2.8 Auto Rokkor HG. This is a rather large lens for its focal length and f/stop, weighing in at 10 1/2 oz. 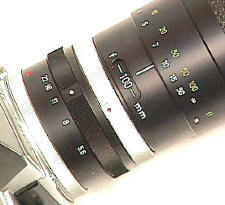 This lens has a 55mm filter size, close focus distance a commendably close 9 inches. 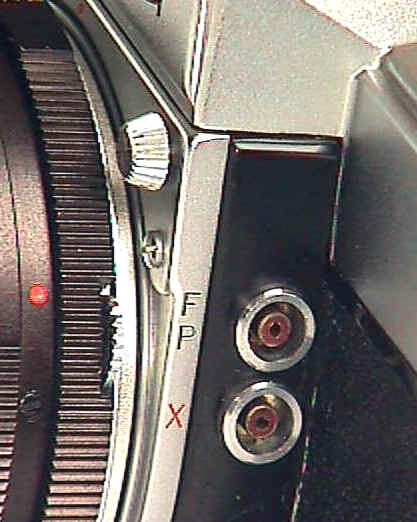 You could not change f/stops without pushing in a chrome lever at the rear of the lens. Clicked marked at full f/stops. 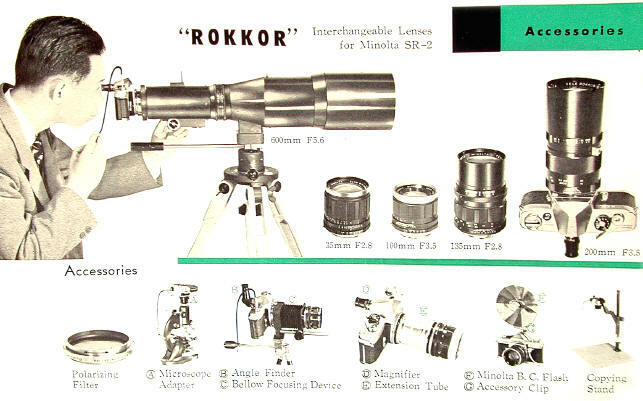 Though not one of the earliest lenses, the economy priced 35/4 pre-set Rokkor has been forgotten by many Minoltaites. It remains one of Minolta's first attempts at low priced SLR lenses. Early SR lens cases are kind of plain. If you look very carefully in the center of case top, at what seems to be at first glance an insignia of some sort, you can read a styled "Minolta." 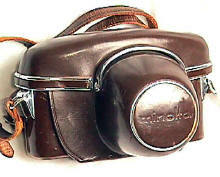 Minolta's 1st SLR portrait lens, the 100/3.5 Auto Tele Rokkor QE. This is a rather large lens for its focal length and f/stop, weighing in at 11 1/2 oz. This lens has a 55mm filter size, close focus distance about 3 1/2 feet. You could not change f/stops without pushing in a chrome lever at the rear of the lens. Clicked marked at full f/stops. 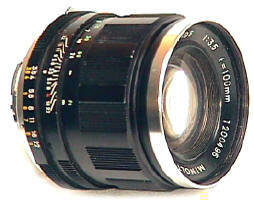 Initially Minolta's longest SLR focal length, the pre-set 135/4 Rokkor TC which was the low budget companion to the earlier 135/2.8 pre-set. This is a rather large lens for its focal length and f/stop, weighing in at 13 1/2 oz. This lens has a 48 mm filter size, close focus distance just under five feet. The illustrious 100-200/5.6 Pre-Set Zoom Rokkor. 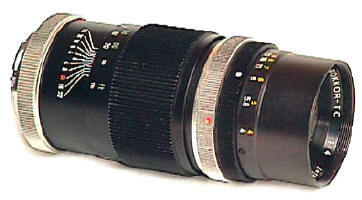 As the zoom zoomed to 200mm, the lens gained 38mm in length. Close focus was a none-too-macro 7.75 feet. Filter size is 52mm. This is a pre-set lens. The photog had to manually turn the aperture to the pre-set f/stop to take the picture, and then manually open up the lens again to focus. Not one of Minolta's more elaborate designs, this simply engineered and finished 100-200 Rokkor zoom looks much more like it came from the mind of Soligor or Vivitar than Minolta. hmmmm. The SR-2's instruction book shows the 35/2.8, 100/3.5, 135/2.8, 200/3.5, 600/5.6, Microscope Adapter, Polarizing Filter, Angle finder, Bellows, Focusing Magnifier, Extension tubes, Flash, and Copy Stand. The SR-1 followed in 1959. It was a less expensive SR-2 with a 1/500th top speed and a slower 55/2 lens, being modified over time in five different variations. The first versions had the semi-automatic diaphragm of the SR-2. The 1962 version was updated with an automatic diaphragm. Eventually it had a different body style, 1/1000th top speed, and depth of field preview on the lenses) with the SR-1s of 1964. Late versions got rid of SR-2 style top plate terraces, replaced with squared body styling. The SR-3 replaced SR-2 in 1960, basically a SR-2 with accessory clip for an add on selenium meter. 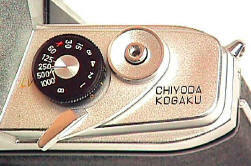 It introduced Minolta's automatic diaphragm. The SR-7 of 1962 looked much like the SR-3 that it replaced, but made history by being the first still camera with built in CDS metering (not TTL). One nicety was mirror lock up. 1962 version had top plate terraces like the original SR-2. 1964 version got rid of the terraces with squared body styling which carried over to the SRT-101. The famous and very successful SRT-101 was introduced in 1966 with TTL metering, MC Rokkor lenses, and self indexing lens to meter coupling. It's worth mentioning that Nikon's 1977 AI coupling is for all intents and purposes a copy of the Minolta SRT-101 MC meter coupling. Minolta was never really in the first ranks of SLR makers until the SRT-101 which set new standards of excellence for Minolta. It remains of the best mechanical SLRs ever. The SR system steadily grew from its introduction in 1958, but was always a quality amateur camera without the extensive professional system capabilities necessary to capture most Pro's hearts and pocket books. This changed in 1973 with the introduction of the professional XK and XK motor. Alas, pros did not trade in their Nikons and Canons for the XK. It was eventually discontinued -- without a replacement. Even today Minolta remains a very capable system fully capable of professional results, but it is still a notch behind the likes of Nikon and Canon with a smaller system and fewer lenses. The new Dynax aka Maxxum 9 introduced in the Spring of 1999 aims at the pro's heart and pocketbook. The 9's abundance of features, some of which are not matched by Nikon and Canon, means that Minolta finally has a pro camera fully capable of going against the best from Nikon and Canon. Time will tell if Minolta's new visit to the Pro ranks is a success.